^ Kauffman, M. American Brutus: John Wilkes Booth and the Lincoln Conspiracies (Random House, 2004) pp. 130–134. ^ Kauffman, M. American Brutus, 174, 437 n. 41. ^ Kauffman, M. American Brutus, pp. 185–6 and 439 n. 17. 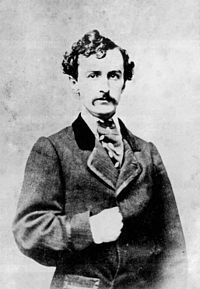 ^ a b c George Alfred Townsend, The Life, Crime and Capture of John Wilkes Booth. ^ Sandburg, C: Abraham Lincoln: The War Years IV., p. 334. Harcourt, Brace & World, 1936. ^ U.S. Senate: Art & History Home. "Andrew Johnson, 16th Vice President (1865)", United States Senate. Retrieved on 2006-02-17. ^ Kauffman, M: American Brutus, p. 212. Random House, 2004. ^ Kauffman, M: American Brutus, pp. 224–5. Random House, 2004. ^ Kauffman, M: American Brutus, pp. 272–3. Random House, 2004. ^ Sandburg, C: Abraham Lincoln: The War Years IV, p. 275. Harcourt, Brace & World, 1936. ^ Sandburg, C: Abraham Lincoln The War Years IV, p. 335. Harcourt, Brace & World, 1936. ^ Linder, D: "Biography of Mary Surratt, Lincoln Assassination Conspirator", University of Missouri–Kansas City. Retrieved on 2006-12-10. ^ Sandburg, C: Abraham Lincoln: The War Years IV, p. 350. Harcourt, Brace & World, 1936. ^ Sandburg, C: Abraham Lincoln: The War Years IV, p. 357. Harcourt, Brace & World, 1936. ^ Stadelmann, M: U.S. Presidents For Dummies, p. 355. Hungry Minds, 2002.